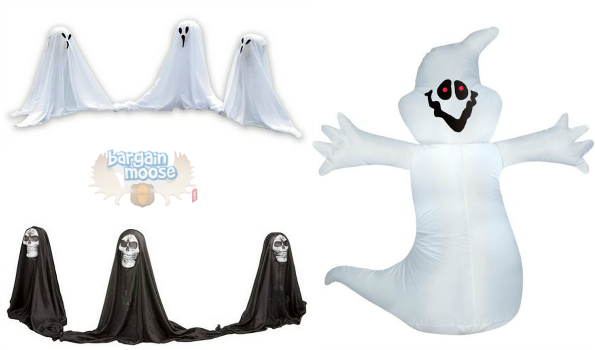 These spooky Halloween lawn reapers and ghosts will be so much fun to creep out your kids and neighbours this Halloween. Check out these decorations over in the clearance at Walmart.ca that was originally $29 but now has been discounted to only $7.25. That save you 75% off the retail price! With summer winding down, we are not very far from one of my favourite holidays. Halloween! Make your Halloween a bit creepier with these fun decorations for your home. Each of these decoration packs comes with three figures. To put these together, you attach a ball to the included pole and then drape the face and fabric over the ball to create this fun or creepy effect. These decorations each stand over 10 inches tall. The ghosts have more of a friendly look to them, and the reapers have the creepy factor going on. I could also see hanging these from a wall, or including these in Halloween décor for a party by hanging them on the wall without the stakes. It would also be fun to suspend the fabric covered globes from the ceiling draped in either the ghost or reaper style for a neat effect without much effort. Where this is really a deal is you are able to pick up three of these decorations at this low price. Around Halloween, a larger size decoration easily goes for much more. There is not much comparable out on the market until we get just a little closer to Halloween. You could also complete your outside display with this Airblown Ghost that was $19, but is on sale now for only $4.75. If you buy all three of these, your lawn will be looking spooky in no time. Over in the comments of the ghosts, the reviews seem to be negative mostly because they fell over. I bet you could attach these to a wooden dowel rod or a stake from your tent from camping to help give these decorations a little bit more support. No one had reviewed the reapers, but I suspect you may want to give them some support also. I would not expect these to be a high-quality decoration, but the price sure is right to make some fun magic for Halloween. Shipping at Walmart is free if you send it to any Canada Post location, or if your order is a minimum of $50, it's free shipping to your home. If you choose to ship it to your home without meeting the minimum, shipping is going to run you $4.97.